These instructions explain different types of scholarship opportunities, and how to search for them in AcademicWorks (Blackbaud Award Management). Apply-To: Scholarship opportunities that require you to take further action, such as answer additional questions, get recommendations, submit essays, or upload other documentation. These have an Apply button in the "Actions" column of the scholarship listing. Auto-Match: Scholarship opportunities that require no additional action on your part. These are matched to you based on imported data such as GPA, major, or your General Application answers. Some campuses require a completed General Application in order to be matched to any Auto-Match opportunities for which you meet requirements. A recommended scholarship is an opportunity that AcademicWorks suggests for you based on information from your General Application and imported data. You should not see any recommended scholarships if you do not already meet minimum requirements. Remember that as your import data changes (changes to your major or GPA, etc. ), your recommended scholarships may also change. When reviewing scholarships, click the name of the scholarship you're interested in and review the information under the scholarship title. Requirements may include, but are not limited to, required major, GPA, new or continuing student status, student involvement, etc. There may be supplemental questions to help guide you through what the scholarship requires. Many scholarships are competitive. Although you can apply to scholarships for which you don't meet all the qualifications, you'll be using time that could be spent applying for a scholarship for which you have a better chance of getting. You must have completed your General Application, and you must be either an Admitted or Current student to be considered for the listed opportunities once you’ve applied. If you haven't already done so, complete the General Application. This application must be completed before you can receive recommendations or apply to additional scholarships. Recommended: Displays scholarships recommended for you based on information from your General Application and imported data. This is generally the best option. For more about recommended scholarships, see above. Ours: Displays scholarships offered through the IU system. 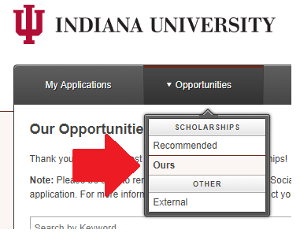 This option allows you to use keywords to search all scholarships throughout the IU system. External: Displays external scholarships that have been added to the AcademicWorks system. If you wish, enter keywords in the search bar to narrow down the list of scholarships. For example, you can search by campus (such as IUPUI, IUB, IUNW) or subject (such as music, technology, research). Searching by one keyword returns any scholarship with the keyword in either the name or description. For example, music returns all scholarships with "music" in either the name or description. All examples in the image above contain the word "music" somewhere in the name or in the description. Searching by two keywords returns scholarships with both words in either the name or description. The system must find a match to those keywords in one of those two places for a scholarship to be listed. For example, music IUK ignores all scholarships that don't have both "music" and "IUK" in the name or description. 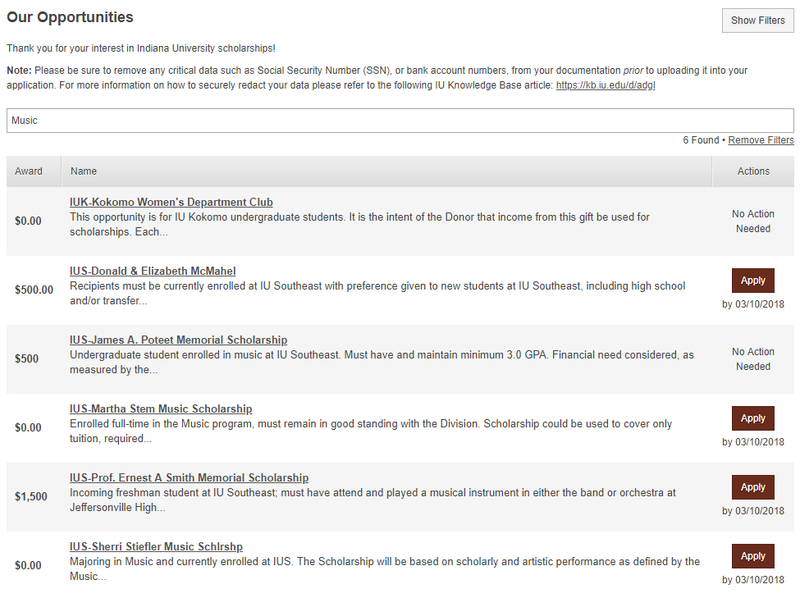 In the example image above, the IUK-Kokomo Women's Department Club Scholarship was dropped because neither its name nor description contain both "music" and "IUK". Its name contains "IUK" but not "music", and its description contains "music" but not "IUK". This is document aqfi in the Knowledge Base. Last modified on 2018-11-13 11:39:59.